3) How many and what kind of “touches” are required to maintain donor relationships among various giving types, levels, and histories? There’s no exact number carved in stone like the Code of Hammurabi or the Ten Commandments of Donor Relations. However, having served as a fundraiser for 19 years and as a consultant to hundreds of nonprofits for another 20 years, performance standards for fundraising staff are often far below what we recommend and what we see in the most successful organizations. 4) How many major and annual donors can a full-time development officer effectively manage? An accurate assessment of an organization’s fundraising capacity is stated in terms of “full-time equivalent” (FTE) fundraisers. An organization may employ a dozen staff members as fundraisers. However, a long list of non-fundraising duties can leave them spending only a fraction of their time meeting or communicating with donors. In assessments we conduct, we are looking for the actual FTE. 5) Given our limited resources, how do we get from where we are to where we need to be as a top-performing fund-development department? 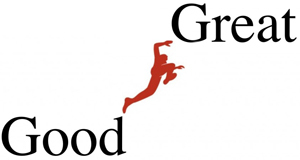 Same question: How do we go from good to great? A strategic plan to attain (and sustain) that level of performance begins with a thorough assessment of the organization’s donation history and its fund development process (i.e., confronting the brutal facts). Gift Clarity, founded by Cayce Powell, two former Microsoft executives, and myself, creates strategic plans for some of the largest nonprofits in North America. A Gift Clarity strategic plan designed specifically for the fund development component of an organization begins with a deep dive into all aspects of giving over a ten-year period. That’s followed by an analysis of the organization’s current donors—who these people are as well as how, when, and why they give to the organization. First of all, their records showed second year attrition rates for new donors ranging from 54% to 45%. The average attrition rate over the ten-year period was right at 50%. In other words, half the first-time donors never gave again. The significance is that first-time donors give at the lowest levels, and they are the most expensive to acquire. When compared to the cost of retaining current donors, new donor acquisition is generally far more expensive. Secondly, the ten-year giving analysis revealed that 80% of ABC income came from a small group of donors—over the ten-year period hovering around 7%—approximately 200 of the 2,800 ABC donors. That’s not an uncommon average for all nonprofits. They simply didn’t have the capacity to follow up with donors who were coming and going. Thirdly, the most significant weakness at ABC was their fund raising capacity. They simply didn’t have the capacity to follow up with donors who were coming and going. They were only able to visit and have conversations with about half of their major donors. Though these three factors tend to feed off of one another and compound the problems, the root cause is the lack of fundraising capacity—the ability to have conversations and build relationship with lots of donors. Based on the number of annual givers, major donors, first-time givers, and lapsed donors, ABC needed 11.5 fulltime equivalent (FTE) organizational fundraisers along with support staff in order to maximize the potential of their donor base. They had five FTE fundraisers on staff. Our recommended fundraising-staff caseload by donor category is below. First of all, Gift Clarity helped ABC prioritize their fundraising efforts by donors’ giving potential based on giving motivations (habitual, tactical, and strategic givers), affinity to the organization, and various other demographic factors. Obviously, not all donors are equal with regard to their giving history or giving potential. To treat them all the same would be a highly inefficient strategy. Consequently, the number and types of “donor touches” for each category should vary based on giving history. The second part of the Gift Clarity Recommendations was a plan to organize the efforts of ABC’s current four fundraisers and the executive director (5.0 FTE) based on the most efficient use of their time—who among the five would focus on relationships with annual donors, major donors, first-time donors, and lapsed donors. Thirdly, the recommendations clarified the performance goals for fundraisers working with donors in the various giving categories in terms of the number and type of “touches”. The objective of each fundraiser was to graduate a percentage of donors to the higher financial commitment—occasional donors to annual givers, annual givers to major donors, and major donors to planned givers. Fourthly, Gift Clarity worked with ABC to establish a five-year staging plan that enables ABC to maximize the performance of their fund development team and the funding potential of the donor base. The strategic fund development plan stipulated when fundraisers should be hired (or promoted) for each giving category based on the evolving donor base and organizational income. Here’s one more question some nonprofit leaders seem to be asking: “Why aim for greatness?” Of course, no leader is going ask that out loud. So, let me rephrase the question. “Why should we go to all the effort and expense to visit, manage, and have conversations with such a large portion of our donor base? Why not keep our fundraising staff small and simply focus on the 7% who are responsible for 80% of the organizational income?” For the ABC Organization, that would have been the top 200 major donors. 1) If we merely aim for the industry standards, then our goal is mediocrity. Emulating the average nonprofit, we are destined to live with all the problems the average nonprofit faces. So, we aim to be exceptional in our approach to fund development. If we merely aim for the industry standards, then our goal is mediocrity. 2) Even when fundraising departments are performing at a high level, life circumstances alone will result in 5%-15% donor attrition. If we only build relationships with our top donors, how can we systematically raise up the next generation of annual givers and major donors to take their place? 3) We don’t know who the next major donor will be. They’re probably somewhere down in the list of our annual or occasional donors. If we limit our conversations to the top 7% or even the top 20%, we may miss the chance to cultivate the next major donor or to realize the true potential of our donor base. The core of our consulting business at Thompson & Associates is providing organizational sponsored estate planning services. When presented with the opportunity, habitual donors who have faithfully given small annual gifts over many years may wind up making multimillion-dollar bequests to the organization. We see this happen with surprising regularity. How many of those donors with similar giving capacity and intent wind up on the list of lapsed donors? Organizations like ABC and a dozen others we are working with really get it. They’re confronting the brutal facts about their own fundraising performance and donor potential. More importantly, they’re engaging in strategic plans for fund development that will take them from good to great.